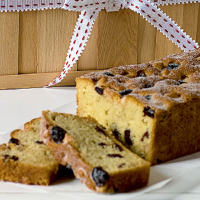 Brandy-soaked cherries and marzipan make this moist cake a real festive treat. Place the brandy with the cherries in a small bowl. Soak for 2-3 hours until most of the brandy has been absorbed. Grease and line the base and sides of a 900g loaf tin. Grease the paper. Preheat the oven to 170°C, gas mark 3. Cut half the marzipan into small dice and coarsely grate the remainder. Beat the butter in a large bowl using a hand-held electric whisk until very soft. Beat in the grated marzipan then the eggs, flour and baking powder. Stir in half the diced marzipan and half the cherries with any unabsorbed brandy. Turn into the tin and scatter with the remaining marzipan and cherries. Bake for 1–1¼ hours or until firm to the touch and a skewer inserted into the centre comes out clean. If it darkens towards the end of cooking, cover loosely with kitchen foil. Transfer to a wire rack, leave to cool and when ready, dust generously with the vanilla sugar.